The Board of Directors of Costa Rica’s Social Security System, or Caja, voted in favor of enforcing a 1 percent raise in the monthly salary deduction of all workers. The measure aims to avoid the bankruptcy of Caja’s Pension System (IVM), the largest in the country. However, in a nod to opponents of the measure, board members agreed that the increase, initially scheduled to begin this month, will instead be phased in. A first 0.5 percent hike will take effect starting July 1 and the other 0.5 percent will kick in on January 1, 2018. The hike means that workers’ monthly salary deduction for the IVM will go from 2.84 to 3.84 percent. The Caja board originally approved the increase in January. Workers’ unions since have opposed the measure, mostly by staging strikes and demonstrating on the streets, demanding alternate solutions for the Caja’s financial woes. The Caja submitted its proposal for public consultation in April and called on the population to weigh in on the proposed measures. 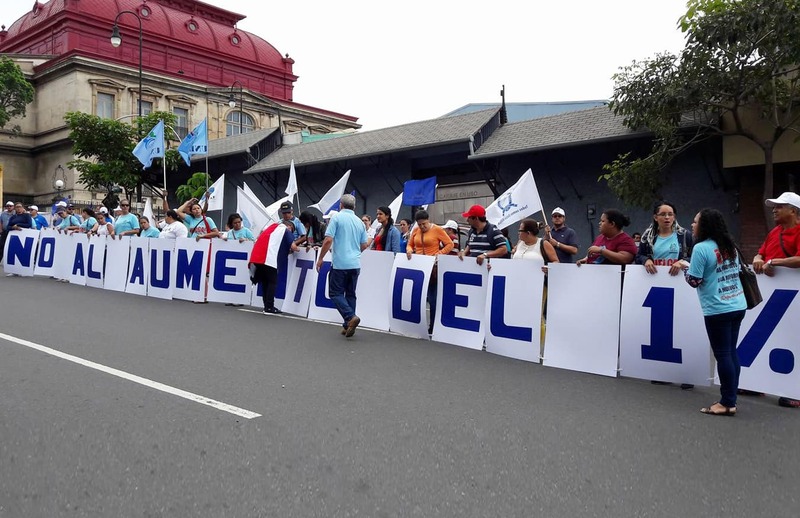 Four separate counter-proposals arrived, including one that workers’ unions delivered last month during a street demonstration in front of the Caja headquarters in downtown San José. The document demanded that the board reverse its decision to raise the monthly deduction. It also included a series of recommendations to improve income without hurting worker’s salaries. Caja Executive President María del Rocío Sáenz Madrigal said in a news release on Thursday that the institution’s leaders took all those proposals and recommendations into consideration. However, board members still voted in favor of enforcing the hike. Sáenz reiterated that the decision to raise workers’ deductions is part of a series of a recommendations in a study conducted by experts from the University of Costa Rica (UCR). The UCR report is one of various studies that have warned about Caja’s financial problems over the last decade. According to the report, the increase in workers’ deductions is one of the measures deemed urgent in the short term to avoid the collapse of the IVM system. The Caja’s IVM pension system currently receives monthly contributions from just over 1.5 million workers and pays pensions to more than 300,000 retired workers. Shortly after the Caja’s public announcement yesterday, several workers’ unions expressed their total opposition to raising the workers’ deduction to fund the IVM. Leaders of the Caja’s Workers Union, the Rerum Novarum Confederation of Workers and the Costa Rican Union Block met on Thursday evening in order to plan their upcoming actions against the rate hike. They issued a statement calling on all public and private sector workers to join in a national protest “against the Caja’s arbitrary and authoritarian decision.” The Patria Justa Collective Union and the National Association of Public and Private Employees (ANEP), the country’s largest union, supported the call and issued another public response rejecting the board decision. ANEP President Albino Vargas said that “taking to the streets is the only option left.” He even went further and demanded that President Luis Guillermo Solís fire Sáenz, the Caja head. Vargas asked leaders of all the country’s unions to support the protest in order to make the Caja’s board members listen. The Caja Board of Directors expects the increase in workers’ mandatory deductions to provide the agency with an additional ¢100,000 million (some $173 million) a year, which will help guarantee the short-term financial sustainability of the pension system. Board members also are discussing long-term measures, including raising workers’ retirement age from 65 to 70. Discussion on these measures is taking place in meetings with representatives of business chambers, workers unions and government officials. The panel is scheduled to present Caja’s Board of Directors with a final report of their recommendations by July 17.